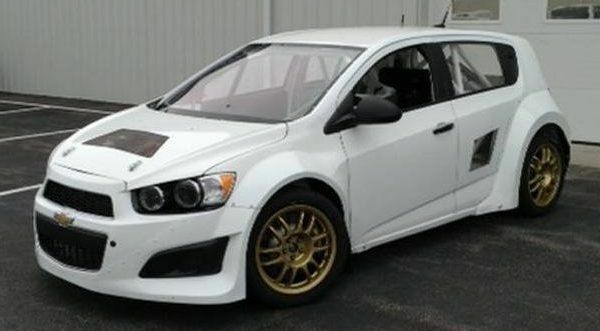 The folks from the Global RallyCross association have announced that General Motors has thrown its hat into the ring for the upcoming event in Charlotte this weekend with a new Chevrolet Sonic RallyCross car driven by former Subaru driver Patrick Moro - meaning that all three of the American automakers is now involved in the booming motorsport. Ford Motor Company has dominated the 2013 Global RallyCross championship in every way with Topi Heikkinen wrapping up the driver’s championship shortly after his success – along with that of Tanner Foust, Ken Block, Brian Deegan and Patrik Sandell – but General Motors wants to steal some of that thunder as the drivers head into the final two events of the 2013 season. The new Chevrolet Sonic Global RallyCross car will be driven by Patrick Moro, who campaigned a Subaru Imprezza WRX in five events during the 2012 GRC season with a best finish of 11th place at the first Las Vegas event. While Patrick Moro doesn’t bring with him a wealth of success in the ranks of Global RallyCross, the new Chevrolet Sonic race car could be just what the league needs to propose a real challenge to the massively dominant Ford Fiesta. The other competitors from Subaru, Mitsubishi and Dodge are all driving slightly larger vehicles and when you combined a small, super powerful Ford with some of the best drivers that the sport has to offer – it’s a tough combination to beat. However, the Sonic race car is smaller and appears to have a footprint much more similar to that of the championship winning Fiesta. Patrick Moro is expected to be the only Chevrolet Sonic racer in the field on September 22nd in Charlotte but Moro told the GRC people that his team PMR Motorsports expects to have a second car in the field at the season finale in Las Vegas. Moro explained to the GRC people that Chevrolet provided support with the engine program with a new sequential six speed gearbox that will help send the power to all four wheels. The only image of the new Sonic race car (as shown above) is plain white so we don’t know who will be sponsoring Patrick Moro (if anyone, right away) but if the artwork on the GRC website is any indication of what the car will look like in North Carolina this weekend – Moro will be flying the Chevy brand on the hood and the Sonic name very prominently along both sides of the car along with a big Exedy logo across the back window. The Chevrolet Sonic Global RallyCross car driven by Patrick Moro might be the right mechanical combination to give the Ford Fiesta a real run for its money but Moro will likely need some seat time before he can really make a run at the likes of Block, Deegan, Foust and Heikkinen. Should the Sonic be competitive early on, it might be easier for PMR Motorsports to find a quality second driver for the other Sonic race car expected to arrive in Vegas.